In order to make known Mao Zedong's contributions to China's foreign affairs, and enable people to study and inherit his ideas on diplomacy, the present book, Mao Zedong on Diplomacy, has been compiled, with the approval of the Central Committee of the Communist Party of China (CPC), by the Ministry of Foreign Affairs and the CPC Central Committee's Party Literature Research Center. This book is a collection of 160 of Mao Zedong's writings, speeches, talks, comments and telegrams concerning diplomacy from July 1937 to May 1974. Most are published here for the first time. Mao Zedong was a great diplomatic strategist of modern times. As the chief leader of the Communist Party and People's Republic of China, he laid out principles of external affairs and diplomatic strategies, tactics and policies during the War of Resistance Against Japan (1937-1945) and the War of Liberation (1946-1949). For 27 years after the founding of the People's Republic he made significant contributions to forming the country's strategic guidelines on international affairs, laying down diplomatic policies, planning important diplomatic activities and opening up a new prospect in China's foreign affairs. 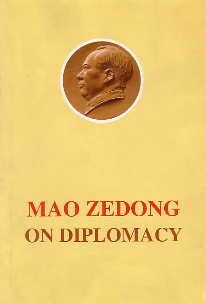 This book records Mao Zedong's fundamental views on international situations and diplomatic strategies as well as his strategic and tactical concepts in and theoretical contributions to foreign affairs. In compiling this book, the editors have remained loyal to the original editions or manuscripts of the articles included in this book. A few changes in language were made in the original manuscripts or articles published before. Transcripts of speeches and talks were edited, with errors of fact corrected and titles added. Notes on the sources are provided at the end of all the articles. Explanatory and editorial notes are also provided. The former can be found at the bottom of the first page of each article, and the latter are numbered and can be found in the appendix.